This case study looks at how Lynda.com is being used in Architecture to support students to learn 3D modelling software. The architecture curriculum in England comprises four areas of learning: the design studio project, communication and representation, history and theory of architecture, and building technology. This case study focuses on the communication and representation methods using digital tools which forms part of our contents for the 2nd year BA (Hons) Architecture programme. These relate to the appropriate modes of communication of architectural design processes and products, including digital drawing (CAD), 3D modelling, and some elements of digital fabrication and building information modelling. This entails a rather large student workload associated to software learning, however it requires linkages and content coordination with other associated modules. For instance, the communication of schematic design development in the form of digital drawings is more relevant for early stages of a design process, as well as a 3D modelling tool supporting building detailing is more relevant for advanced stages of the design process. It is fundamental that students’ self-directed learning involves software learning as well as developing the capacity to apply that knowledge as part of their design studio work. Moreover, software learning often implies an individual mode of study (following a step-by-step tutorial) - this greatly challenges the collaborative nature of design studio work. Lynda.com provides a flexible approach to software learning tailored for this mode of study. In order to deliver a comprehensive technology-supported experience, a number of changes have been implemented within the last three academic years, which includes the development of workshop delivery systems consisting of combined learning mechanisms, including existing online tutorials from Lynda.com as part of group collaborative work. What were the benefits of using Lynda.com for students and tutors? A more diversified delivery facilitated session planning as the module is no longer a “software tutorial” course, but instead a design course with software self-directed learning components and workshops. This had a positive impact on engagement and feedback from students and associate tutors in both the module as well as design studio courses. Lynda.com and other online mechanisms to support our delivery had an overall positive impact on the course. While we utilised these resources for teaching activities, it has been observed that students engage with these resources outside teaching hours as part of self-directed learning. the large amount of courses, often addressing similar (or the same) software but for different users and professional knowledge niches. Very welcoming introduction of software teaching in Y2. Tutor very excited about the opportunity and how software can be part of the fabrication process. However, this is only taught in Y2 and it would be interesting to see more continuity across the BA. 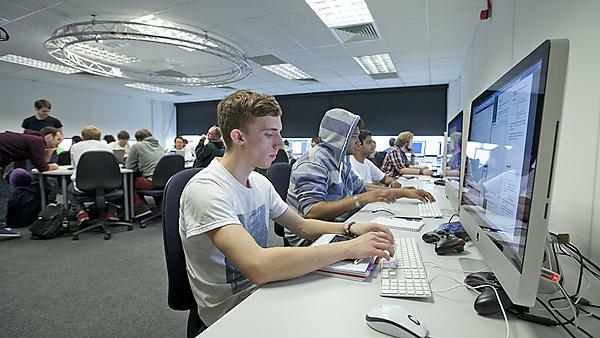 Further work is being planned to engage with professional skill-sets and more broadly, to correlate students’ inductions and software learning (often an individual process following a tutorial) with professionally established modes of architectural production and situated learning (often collaborative and open-ended). Given the rapid pace of technology development and the release of new, updated digital tools, the module requires a constant review in order to stay up to date with relevant resources for students’ work. Many thanks to Alejandro Veliz Reyes for agreeing to help Academic Support, Technology & Information create this case study.